Portal Zine - Whenever held overseas visits, or receive honorary guests from several countries, President Joko Widodo (Jokowi) admitted often get a lot of questions about a number of current issues. One question is how Jokowi handle terrorism cases in Indonesia. Got a question, Jokowi directly with a straightforward answer. Whereas, the problem of terrorism can not be done as do the countries in the world. "Always I have to say that the security approach performed worldwide is the approach does not solve our problems, there is a security approach but the most important religious and cultural approach," said Jokowi while inaugurating Transformation College of Islamic Religious Affairs and 5,000 Doctoral Program Year 2015-2019 at the State Palace, Jakarta, Friday (19/12). Jokowi believes, religion and cultural approach can apply permanent and able to maintain the security of the state. 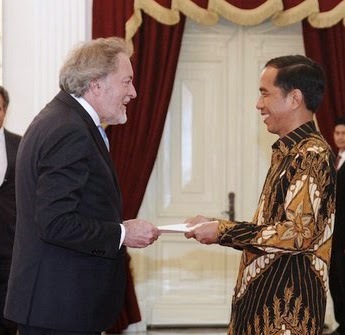 He asked them to see directly how Indonesia in dealing with counter-terrorism. "They asked, religious and cultural approaches. Like what? I say, ask-ust ust us, kiai us, wondering at NU, Muhammadiyah, other mass organizations. If you ask me, I'll answer wrong, "said Jokowi laughter from the audience.